Wire Radio Antennas are sometimes maligned when it comes to their use for as base or portable antennas. While they may not be as attractive as a multi-element beam up at 40 feet plus they are certainly no less effective. A wire antenna such as the dipole displayed to the right is a very effective antenna when cut for the frequency range you wish it to operate in. The majority of wire antennas you see will be for a single band meaning you will need an antenna for each band you will be operating on. 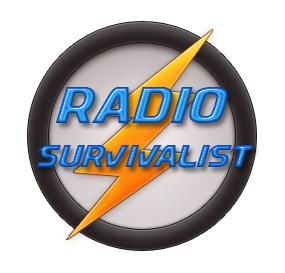 There are some wire antennas that are deemed as multi-band when used with antenna tuner placed inline between the radio and the antenna. Wire antennas like the dipole pictured above are simple to make using the formula: 468 / frequency (in megahertz). All you need to do is divide the number 468 with the frequency you wish to operate. Now take this measurement and cut a single wire to that length, next cut this wire exactly in half and separate the pieces with an insulator as shown in the picture. All you need now is to connect some coax (radio cable) to the antenna by affixing the center conductor to one leg of the antenna and the shield of the coax to the other leg. The most popular way to mount a wire antenna is the inverted vee configuration where the center of the antenna is mounted as high as possible and the ends come down to the ground forming an upside down V. As to be expected, the ends of the antennas must be insulated from the point where they are attached to the ground. One of the best ways is to use some sort of non-conductive material like plastic to attach to the end of the wire. Once this is attached to the ends of the antenna then you can tie the ends off to the ground with rope. One of the simplest antennas as listed above is the inverted vee, but there is yet another equally effective antenna which is the simple dipole mounted in a horizontal configuration. Same method of design and building as the inverted vee but it is the mounting that differs from the inverted vee. Instead of placing the middle of the antenna up high you make both ends of the antenna as high as possible and as near the same height as possible. One drawback to this type of dipole is that the center insulator must carry the weight of the two antenna ends as well as the coax feedline. The feedline for these antennas can add a lot of weight to the antennas when you consider a length of feedline needed for an antenna 50 feet or more in the air. This issue alone is worth considering the inverted vee mounting configuration (unless you use a rope to support the full length of the dipole). I am indebted to W4RNL for a large amount of information on Delta Loops . 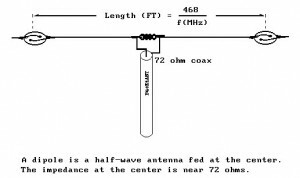 He has modeled many forms of this antenna and I would like to pass along some of his findings. All of the following were contained in a discussion forum on the QRP-L reflector, and were submitted by W4RNL (L.B.Cebik). For maximum vertically polarized radiation, the feedpoint should be 1/4 wavelength from the apex (whether pointed up or down). The antenna should be relatively close to the ground. For a 40 meter model, 15 to 30 ft up to the bottom is max, and models suggest that this scales for other bands. If higher at the bottom than about 0.2 wavelength, then a second high angle lobe develops, and stronger, closer in stations can override more distant stations, even if the lobe is not dominant in the pattern. The Delta is at its limit on 20 meters of being a better DX antenna than a dipole, you will not get more gain from a Delta Loop over dipole, but it may exhibit a better signal to noise ratio – hence more comfortable listening. Although the vertical-plane delta loop either pointed up or down and fed virtually anywhere will radiate well enough to provide contacts, it is a relatively poor performer in any configuration when stretched to other bands, compared to even the simplest substitute. Modeling of Delta Loops and similar antennas has proven to be a quite reliable indicator of performance, since nothing in the antenna type even approaches, let alone exceeds, the limits of the software for accurate modeling. So the following notes may be useful. These notes apply to vertical-plane equilateral delta triangles, although with some variation, they apply equally well to vertical-plane right angle deltas. Modeling was done on NEC 42. First, the antenna. A vertical-plane equilateral delta for 40 meters will be about 48ft 5in wide and 42ft high. This places limits on the height above ground of the lowest point, since with a 35ft low-point height, the high point is 77ft up. For the examples below, a standardized 15ft bottom point is used, with a 57ft upper point. When fed as a self contained vertical, maximum bottom heights of 20 to 25ft yield the highest gain (about 1.45dBi) with an elevation angle of maximum radiation of between 16 and 17 degrees. The first signs of a secondary higher angle lobe just make an appearance, but do not constitute a problem relative to the antenna’s use as a low-gain, low-angle DX antenna with superior signal to noise characteristics due to insensitivity to higher angle radiation. As the antenna is raised by another 5 to 10ft, the secondary lobe increases, so that with a bottom height of 40ft, the antenna’s secondary high angle lobe at 60 degrees is down by only 4dB or so. As the antenna is lowered, gain decreases very slowly (imperceptibly), and the elevation angle of maximum radiation increases very slowly (about 1 degree for each 5 feet of lowering. A 15 ft lower wire or point height provides good performance within this class of antenna. Moving the feedpoint to a mid-side location increases gain by increasing the amount of horizontally polarized radiation produced by the antenna. This increases the elevation angle of maximum radiation as well as spreading the main lobe vertically to permit considerable amounts of higher angle radiation. In effect, moving to far from the feedpoint prescribed for use of the vertical plane delta as a vertical antenna tends to defeat that purpose. However, the vertical-use feedpoint itself is not critical within say 5% or so of the recommended point. Leave it to some people to use the materials at hand to make a difficult task easy. In this case you can use a converted fishing reel to launch the leader for the antenna line up into a tree and then pull the antenna up in place. More antenna about launching and mounting dipole antennas can be found here: mounting wire antennas. 2NEC 4 The Numerical Electromagnetics Code (NEC) is a popular antenna modeling software package for wire and surface antennas. It is credited to Gerald J. Burke and Andrew J. Poggio, and was originally written in FORTRAN in the 1970s. The code was made publicly available for general use and has subsequently been distributed for many computer platforms from mainframes to PCs.